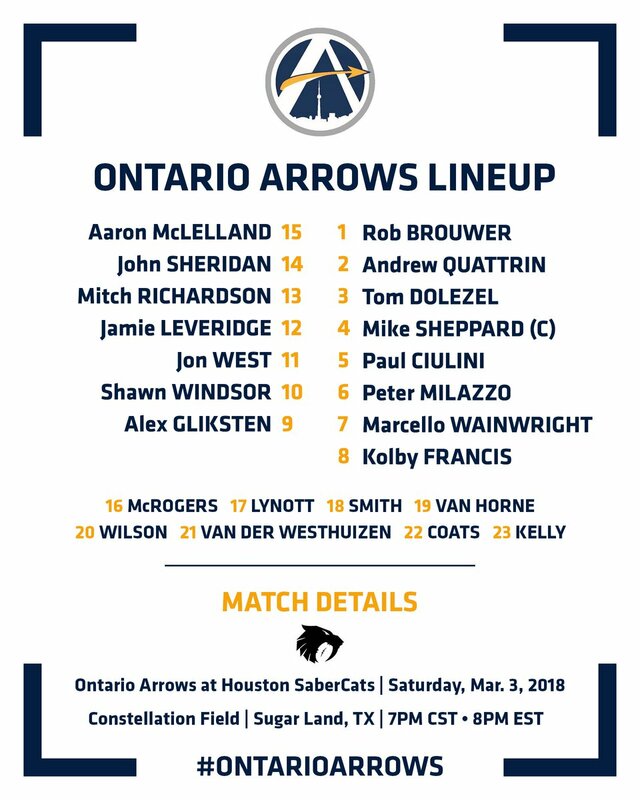 In a match up between a Major League Rugby team and a potential Major League Rugby team the Houston SaberCats hosted the Ontario Arrows. Matt Trouville got the scoring started. The SaberCats got a lineout deep in Arrows territory and worked it close to the try line. Trouville then had a nice show and go for the score. Pangelinan just wide the conversion. Shawn Windsor got the Arrows on the board. After a penalty for not releasing on the SaberCats, Windsor put a 40+ meter kick through the uprights. This was a tough match. Both teams were having handling issues. But this was a good look at a potential future MLR match. Rob Brouwer was lucky to escape a yellow card. After an Arrows penalty, Connor Murphy tried to quick tap, but Brouwer wasn't back 10 meters and had a high tackle on Murphy. Sam Windsor added to the SaberCats lead with a penalty kick after that sequence. Mike Sheppard got the Arrows first try. After a knock on from Malacchi Esdale, the Arrows worked the ball across the field before Sheppard found a gap for the try. Conversion was good to put the Arrows up 10-8. Windsor again with the penalty kick. This was a quick fast paced match. The SaberCats got some competition from the Arrows, so they took points when they could. Windsor's kick put the SaberCats up 11-10. 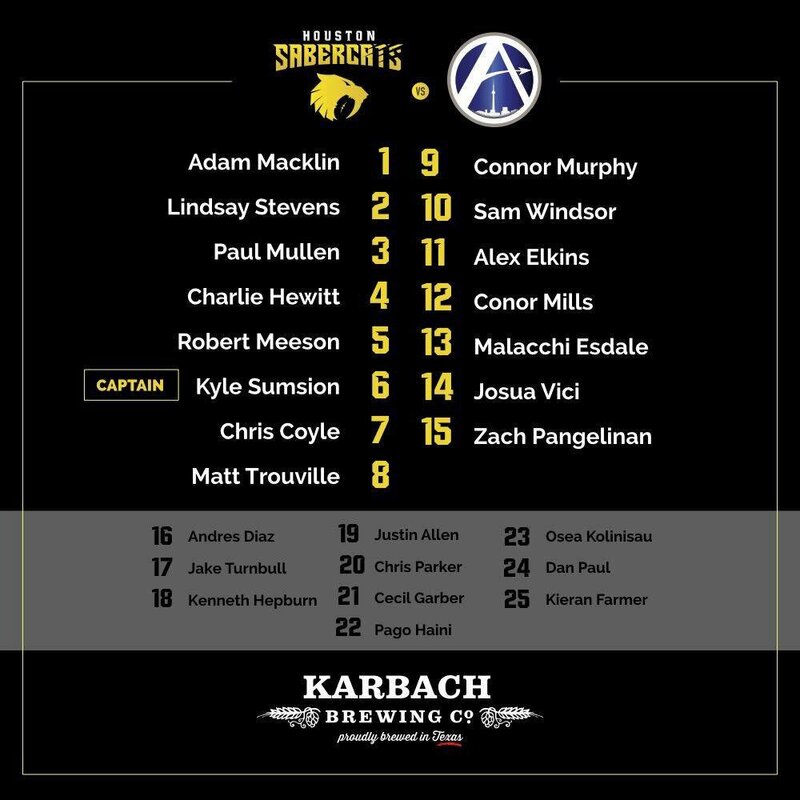 Zach Pangelinan added on for the SaberCats. After an early push from Ontario, Connor "Quick Tap" Murphy with the quick tap and pass to Pangelinan who ran 50 meters untouched for the try. Windsor with the conversion to put Houston up 18-10. The SaberCats played some great defense deep in their own end. After a high tackle, the Arrows were able to kick to touch for a five meter lineout. The SaberCats were able to bring the maul down and turn the ball over. Both the Arrows and SaberCats were playing pressure defense. After some early scrum troubles the Arrows were able to get a couple clean scrum wins. After being held up in goal, the Arrows won the five meter scrum and were able to work the ball wide for the try. Andrew Quattrin was able to dot down for the try. Shawn Windsor with the conversion. The SaberCats led 18-17 at halftime. John Sheridan got the scoring started in the first half. After some miscues from the SaberCats, the Arrows were able to work the ball down the field before West dotted down in the corner. Conversion just wide. Arrows led 22-18 at his point. This was a great front row test for the SaberCats. The match up against the Uruguay national team was the last match that the SaberCats got a good test from the front row. In all the other matches the SaberCats have been dominate in the scrum. Shawn Windsor was able to extend the Arrows lead to 25-18 with a penalty kick after a scrum penalty. The SaberCats were called for bringing down the scrum. After an Osea Kolinisau line break, Jake Turnbull was able to dot down for the SaberCats. Sam Windsor just wide with the conversion. Josua Vici was able to put the SaberCats in the lead. After forcing a knock on from the Arrows and a couple missed dangerous tackles from the Arrows, Vici was able to dive across the try line to put the SaberCats up 28-25. Windsor just wide with the conversion. Cecil Garber provided some great defense to preserve the SaberCats lead. With the Arrows threatening to score, Garber was able to force the turnover and get it to Murphy for the clearance kick. Will Kelly tied the game at 28. After a high tackle call on Petey Hepburn, Kelly put the kick through the uprights to tie the score. This game ended in a tie, but the SaberCats tried hard to win. Petey Hepburn had a line break, Conor Mills had another and offloaded to Vici. Ontario was able to hold the SaberCats up short of the try line and gain possession of the ball and kicked to touch to end the game. While a tie is not the result either team wanted, this was a hard fought physical match. Both teams got line breaks and both defenses were able to get back and cover. This should be the standard of a Major League Rugby match. Hard back and forth play and plenty of offense, great defense, and big hits from both teams. Edit: The try scorers have been updated per received corrections.